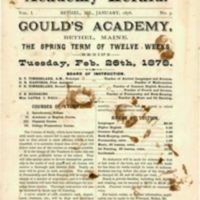 The Academy Herald was a short-lived periodical published by the students of Gould's Academy between 1877 and 1879. 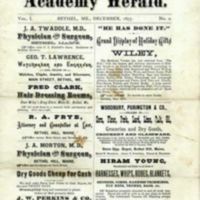 The Academy Herald was originally intended to appear monthly, and then, with the fourth issue, quarterly. In total, just six issues were published: four during the 1877-1878 school year and two during the 1878-1879 school year. 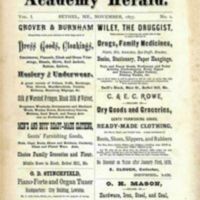 The "Academy Herald" name was later revived with a new publication, which first appeared in 1897, and eventually evolved into the school's annual yearbook.